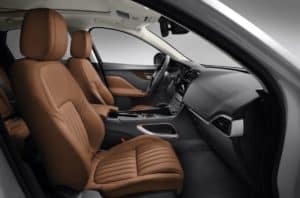 The luxury 2019 Jaguar F-PACE offers a sporty interior, powerful performance, and everyday driving capability owners will truly enjoy. This engaging vehicle can transform travels around Marlboro, Englishtown, and Freehold. 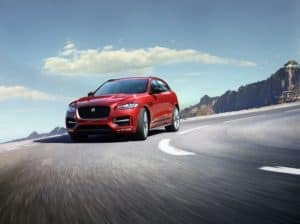 Discover the exciting F-PACE at Ray Catena Jaguar Marlboro. Our sales consultants are here to explain everything you need to know about this vehicle, including its newest standard offerings and available packages. Continue reading this review to become an educated and informed driver. The F-PACE engines provide an inspiring drive, beginning with the base engine, a 2.0-liter 247-horsepower 4-cylinder. The supercharged V6 gas engine produces 380 horsepower and 332 lb-ft of torque for a commanding yet sporty drive. The all-new F-PACE SVR trim is impressive, a V8 delivering 550 horsepower and 502 lb-ft of torque. The turbocharged diesel engine produces 180 horsepower and is highly fuel-efficient. Whether linked to the 8-speed automatic transmission or the SVR 8-speed automatic QuickShift transmission, drivers will enjoy quick shifting and easy acceleration. Gain confidence regardless of what the roads ahead bring, thanks to the standard all-wheel-drive system. Combine that with the lightweight aluminum architecture of the vehicle offering protection to everyone inside, and you’ll receive outstanding performance along with excellent protection. There’s space for five people inside the 2019 Jaguar F-PACE, with two rows of supportive seats. Whether up front or in the back, there’s plenty of space to stretch out. The rear legroom of 37.2 inches means up to three adults have space to sit together, and there’s also the available electric recline functionality to find the perfect seating setup. Cargo space might be important to you, too. You’ll have over 33 cu. ft. behind the rear seats—enough room for luggage or an outing at the beach. When the rear seats are folded down, over 63 cu. ft. of cargo space will be available. In terms of in-car technology, the 10-inch Touch Pro™ hardware includes swipe and pinch-to-zoom functionality. Get to your destination, pick a new song, or make a phone call using this helpful touchscreen. It’s important to feel safe out on the roadways. After all, you may be transporting your family, friends, or pets in the car with you. The standard driver-assistance features are designed to be a guiding light every time you step inside the car. Emergency Braking: If a possible collision is detected, the audible Forward Collision Warning Alert will sound. The brakes can be applied if you aren’t able to react in time. Lane Keep Assist and Driver Condition Monitor: If your F-PACE is drifting from its lane, it can be guided back using corrective torque. The Driver Condition Monitor tracks driver ability, and can sense if you’re distracted or drowsy, giving a warning when a break may be needed. Rear Camera: The standard rearview camera lets you see what’s happening behind the vehicle without craning your neck. A quick glance at the touchscreen is all you need. We hope this review has been informative and helpful. 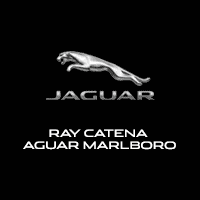 To see the 2019 Jaguar F-PACE up close, visit Ray Catena Jaguar Marlboro. See how this car handles the streets of Marlboro, Englishtown, and Freehold at our Jaguar dealer today.